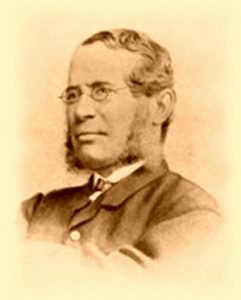 Henry Thomas Smart (1813 – 1879) was an English organist and composer. Born in London, a nephew of the conductor Sir George Thomas Smart, he first studied law, but soon gave this up for music. In 1831 he became organist of Blackburn parish church, then of St Giles-without-Cripplegate, St Luke’s Old Street and finally of St Pancras, in 1864. This last post he held for the rest of his life. Smart was highly rated as a composer by his English contemporaries, but is now remembered only by a few organists and choral singers. His many compositions for the organ were described as “effective and melodious, if not strikingly original” by the 1911 Encyclopædia Britannica, which also praised his part songs. His cantata The Bride of Dunkerron was written for the Birmingham Festival of 1864; the oratorio Jacob for Glasgow in 1873; and his opera Bertha was produced with some success at the Haymarket in 1855. His best known composition is now probably the hymn tune Regent Square, commonly sung to the words “Light’s abode, celestial Salem” or “Angels, from the realms of glory”. His Evening Service in B Flat has enjoyed a renaissance in recent years. In the last fifteen years of his life Smart was practically blind.